Padre is a thirty-minute release showcasing Jumbled’s sample-based production and his ear for unique sounds. The instrumental project represents a change in the life of Jumbled as a producer and a man. Padre is laced with comedic interludes sampled from stand-up comedians that chronicle the joys and pains of fatherhood. The Real Hip-Hop recently spoke to Jumbled about his start in Hip-Hop, providing production for various rap artists, his unique style, and his new instrumental album, Padre. TRHH: How’d you get the name Jumbled? Jumbled: [Laughs] I’m John Matthew Bachman and I think seeing that occasionally made me think it’s kind of weird seeing those three letters together. I didn’t really ever think about it. When I started making beats around ’06 I was using the name “Napalm Def” because I was playing in punk bands at the time and I thought it was a good play on words. I had a friend that started rapping and I felt like beats and rhymes were separate for some people. I picked this name and just went with it. I still use Napalm Def for my Twitter handle, but Jumbled has been the way since at least ’06. TRHH: What made you get into Hip-Hop production? Jumbled: I think I was always kind of interested, I just never understood how to do it. I was playing with different things at Guitar Center and talking to different people. I didn’t know there was a local scene. I had a friend that was doing production stuff, but he was doing everything on the computer, so I didn’t know how to start. I had the internet but I didn’t know where to look. I’ve never been a big YouTube guy. I stumbled upon getting a sampler but then I had to figure out how to add drums, so eventually I bought a drum machine but never really figured out how to program it. I was just more kind of playing it manually and I would loop those things. It just kind of evolved from there figuring out which computer stuff would work the best and what was more comfortable. I kind of fell into Audacity which makes everyone laugh or step back. I’m pretty comfortable with Ableton, but I don’t like building things in Ableton. I kind of always go back to Audacity. It’s less structured I think and I can kind of move things around a little bit easier. TRHH: I use Ableton and I’ve tinkered with Audacity; I don’t see why people would laugh about that. It’s much simpler. Jumbled: [Laughs] It’s so amateur. It’s like when you get a turntable and a program to rip vinyl. When I did a little bit of Baltimore club stuff I’m like, “Okay, this needs to sound cleaner and tighter.” But then I’m like, No, I just don’t like it. TRHH: What does your production workstation consist of? Jumbled: I have long skinny table in my office. It has a mini-mixer that mostly runs the turntable and I have the keyboard run into it. The turntable runs into the sampler where I can loop things and add some effects. And then I just have a laptop with an audio interface. I think that’s starting to go. I got that for a Christmas present. I never really understood how to make that connection. I feel like I want to help people. It’s not as hard as it seems, but I feel I have these really old-fashioned ways, but they’re just so comfortable. Making beats for me is an escape. It’s a hobby to some extent, but it’s also like, okay, I’ve done what I need to do or if I get up early in the morning that’s when I have time to work on stuff before my family gets moving or if we have to do stuff on the weekend. It’s a pretty minimal set-up. I have a Casio keyboard that has different sound effects. It’s mostly for bass lines and other effects. I’m trying to figure out how to do some live bass stuff. I have a bass guitar, but I want to get a pedal and distort it a little bit before I record it. I like trying new things. It’s still very fun for me. Every time I do it I get very excited, which isn’t very much these days. TRHH: What sampler do you use? Jumbled: I have an SP-303. I’ve had it for about twelve years. It’s been in the shop a couple times and I always think, “Okay, this is it. I’m going to have to get a new one or upgrade.” Because everybody seems to have a 404 because it has twice as much room. It always seems to come back to life, so I can’t do without it. TRHH: You mentioned the bass; did you have a musical background before you started doing Hip-Hop? Jumbled: I played saxophone, which I’ve tried to mess with that but I don’t have the mics to do anything with it and I’m so out of practice with it. I played the saxophone in elementary and middle school. I can read a little bit of music, but when you get into piano I have bass clef instead of treble clef. I tried to dabble with a song about drinking coffee and I tried to look up the notes. I was like, “Okay, this makes sense” but not specifically. In terms of keys and chords, I don’t know anything about that stuff. I wish I did. I’ve never explored it too much. TRHH: How’d you link up with Lace Berriez for “You Best Not Miss”? Jumbled: About a year and a half ago I got linked up with this rapper/organizer named Fleetwood DeVille down in Northern Virginia. He had an open mic and invited me to come out and play. It was a hookah shop and they had four or five emcees freestyle over beats. It was a really small event on a Wednesday or Thursday. I met Lace and a couple of other people. We shared contacts and keep in touch on Twitter and Facebook. I had this backlog of beats. I’d send beats to other people and they would just follow up every couple of months. I would get pushed to the side and I was like, “I’m getting tired of this. I need somebody I can send beats too immediately and get some feedback or get them to work on them.” He was one of the few people that responded. I sent him four or five and he said, “These are great, send more.” I cleaned them up and he recorded them as soon as he could and sent them back. I got them mastered and it came together really quickly. I haven’t seen him in person since that event. Jumbled: Oh my God [LAUGHS]! TRHH: I would rather you say, “Hey, I don’t like this,” than say nothing at all. What has your experience been like communicating with rappers after you send them beats? TRHH: You have some boom bap stuff and some dance stuff; how would you describe the Jumbled sound? Jumbled: [Laughs] I think I always use the word “gritty” because a lot of the stuff is from dusty vinyl. Even the dancy club stuff, I try to pull from faster disco breaks and try to pair it up with Baltimore club stuff. The drums are sampled from vinyl. I have a limited collection of that stuff because it’s so hard to find anymore. I’d call it gritty and dirty. The Hip-Hop stuff is pretty lo-fi and the club stuff is pretty lo-fi. Even when I try to clean it up and polish it, it’s still gritty compared to a lot of popular, not mainstream, but big artists like Black Star, their stuff is so clean and polished because they’ve been doing it for so long and they don’t sample stuff most of the time. TRHH: If you could produce an entire album for one emcee who would it be? Jumbled: Wow. That is a hard question. TRHH: Give me a couple. Jumbled: [Laughs] I would love to do stuff with Action Bronson, MF Doom, and The Man From Somewhere Else. I really wanted to shoot my shot with Meyhem Lauren, but then he started doing stuff with Muggs and other people that do what I do so much better [laughs]. I’ve been trying to reach out to more people like CRIMEAPPLE and Willie the Kid because I feel like they’re doing my style of stuff, but they aren’t at a local level. I don’t have my stuff that much out there. I like what Your Old Droog is doing a lot. I wish he would put out some more stuff, because what he has put out has been really good. TRHH: What’s next for Jumbled? Jumbled: My new beat tape called “Padre.” My daughter is 16 months old. We adopted her and all of my music stuff was in where her nursery is right now. She came home and slept in our bedroom for a pretty long time, but then it was like, “Okay, you need to pack up all of your music and memories that you’ve worked on in this room for a while so she can have her own space.” I kind of restarted this new chapter where I started making new music. I don’t think it changed the style as much, but it was the end of an era and the start of a new era. I’m pairing that with being a father because it is very new to me. I’m working on a project called Orsulak, which is an old Orioles baseball player. I’m getting live guitar samples and pairing it up with break beats. It’s mostly instrumental and there’s two songs with vocals. I kind of want to experiment with that to get some kind of placements. I kind of want to see how that goes, I’m sure it’s not going to go well. Most of the stuff I do is samples and it always gets tricky and causes more problems than it’s worth. I want to see if it’s a popular sound. Most of the stuff is kind of hooky because of the way the guitar player played. I like it and the people I’ve shared it with really like it. Beyond that it just turns into a waiting game with some other projects. I have stuff with Ullnevano and Riki Weeks. Weeks is a teacher/administrator. He played a benefit show that I hosted last year and we’ve been in touch for a while. It turns into when he has time. I’m sure he’s writing, but I think he has 2 or 3 kids too, plus working at a school. 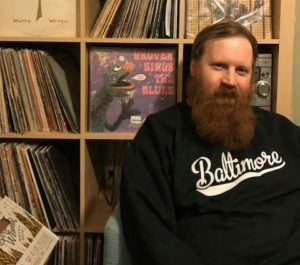 I want to find some new people outside of Baltimore, but Baltimore has so many really good people right now that I think I’d gel with, but they’re starting to get more and more popular like Jay Royale, ILL Conscious, and Dirt Platoon. I’m just kind of waiting to see and trying to make some new stuff when I can. I want to start expanding my reach a little bit more, trying to reach out to some more people and see if anything picks up from there. This entry was posted in interview and tagged Baltimore, interview, Jumbled, Lace Berriez, Maryland, Napalm Def, Padre, You Best Not Miss. Bookmark the permalink.